It's Meatless Monday, and you know what that means, a vegetarian dish! We're traveling over to India today and cooking up a delicious, and simple vegetarian curry. This is not only tasty, but it's very hearty too.. you won't even miss your meat! It's not spicy either, so hopefully the kids in your life will give it a try. You can eat it over a bowl of warm rice, and I can guarantee you that it will warm you up. Like a few of our recent Meatless Monday dishes, this dish is not labour intensive, yet it yields delightful results. I'd also like to take this post to introduce everyone to my wonderful, wonderful new mentor! Jules from Butcher, Baker. We've been paired up for a couple of weeks now and she's so sweet and wonderful! It was through the Adopt-A-Blogger initiative that she found me, and I have to say I am so glad! Being in this food blogging world, and trying to navigate it all by myself can be a little intimidating - have you seen the thousands and thousands of fellow foodies out there? I'm glad to have someone on my side! Jules' blog is filled with tons of neat recipes, and wonderful commentary! If you haven't, please check out Jules' blog! I love it so much, I've bookmarked this foccacia recipe and I'm slowly, but surely psyching myself out to make it! 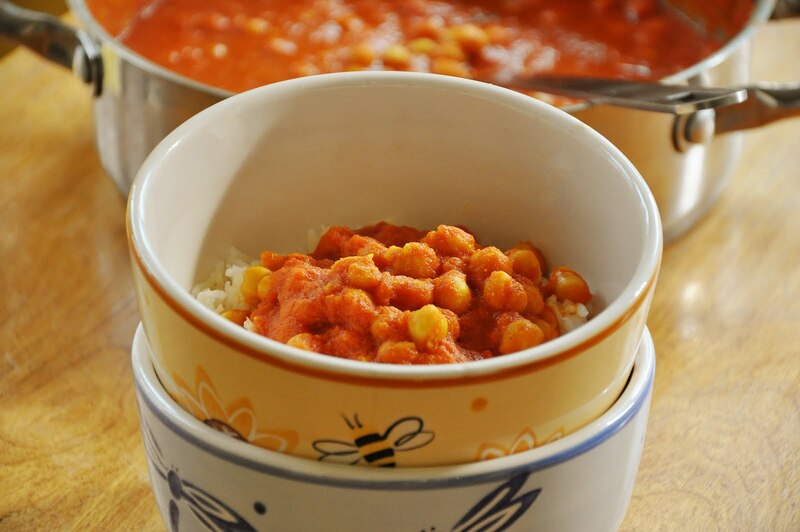 Go check out Jules' blog, and while you're reading why not eat a warm bowl of this hearty curry? This curry is sure to warm you up, and the meat lovers in your household won't even be complaining about the lack of meat and the vegetarians will love it. Happy Meatless Monday! And keep an eye out later this week, I'll be posting a recipe for homemade curry powder - none of that store bought junk!